Reset User Passwords with AD Self Service Portal – Updated! Being able to reset user passwords with an Active Directory self service portal can save you a ton of time! I have seen many options for handling this problem – most are not free and many can be a difficult to setup. By using Exchange and PowerShell, we are going to setup a free self service password reset tool for our Active Directory users. We are going to start off with the password reset script, then configure it for your environment, and finally cover ways to get your users to use it. Give me 30 minutes and I’ll get you out of the “I forgot my password” business. Copy the script and paste it into a PowerShell ISE prompt. I’ll meet you at the bottom. #User who shold recieve email notifications that a password was reset or an invalid request was sent. $aChars = "a", "b", "c", "d", "e", "f", "g", "h", "i", "j", "k", "m", "n", "o", "p", "q", "r", "s", "t", "u", "v", "w", "x", "y", "z", "A", "C", "b", "D", "E", "F", "G", "H", "I", "J", "K", "L", "M", "N", "O", "P", "Q", "R", "S", "T", "U", "V", "W", "X", "Y", "Z", "2", "3", "4", "5", "6", "7", "8", "9", "_", ";"
This awesome script comes from Gerald Moody. If you use Office 365, see the script at the end of this post. At the top of the script, you’ll find the Configuration Block. You will need to set each of those variables for your environment. You will also need a dedicated AD account to use with this script. The account should have just the reset password permission delegated to it in Active Directory. It should also have a simple email (ex: reset@yourdomain.com). Next, you will need to download the Microsoft Exchange Web Services Managed API 2.0 installer from here. Install this on the machine that will be hosting the script above. It does not have to be installed on your mail server. The machine’s IP will need to be able to send emails externally. A relay connector should be configured on your Exchange server. The machine that will run the script also needs the Active Directory PowerShell module installed. On Server 2012 R2, this is found in Add Roles and Features under the Remote Server Administration Tools location. Completely random passwords might not be your cup of tea. Reader Mike Liebstein replace the Create-RandomString function with the version below. It relies on a dictionary file (.\dict.csv) that is located in the same directory as the script. If you do not want to create a wordlist yourself, you can download this one. $conjunction = "or", "after", "as", "if", "than", "since", "the","my","we","our","and","but"
Finally, two points on security. First, at no point is a user’s name delivered to the end user. For a user to reset their password, their phone number has to be pre-entered into their AD account. A malicious user would have to have the username and a way to intercept the password. If your management is skittish about this method, you can add a security question to the process. Simply modify the search body portion of this script to match another user attribute to AD. Then inform your users to text your reset email with that attribute (like a birthday). If the cell number exists and the birthday matches, it resets the password. Now that your script is configured, create a scheduled task. The scheduled task needs to run as a user that can reset AD passwords. Set the scheduled task execute once a minute. Don’t worry about AD performance, AD is only queried if the $ResetEmail user has an unread message in its inbox. Let’s test this out now. Open up Active Directory Users and Computers. Find a test user and enter your cell phone number under that user’s mobile phone attribute. To verify that the password was changed, just open CMD and type: net user /domain USERNAME . Scroll down to the password last set line and you should see that the password was changed! When the $LoggingEmail variable is set, you will also receive an email confirming that the password has been set. In testing mode, the subject includes the password. This can be removed on line 71. Is the exchange version right in the Configuration Block? If you didn’t receive a text back, make sure the reset text message reached the inbox of the reset user. Make sure it was marked a read (processed). If you received a text back but the password didn’t change – check user permissions? Can your $ResetUser manually reset the user’s password? Some readers reported issues with the (ConvertTo-SecureString -AsPlainText $PW -Force) line – if needed, you can remove this from the Set-ADUser line. To distribute this to your users, you can configure a custom logon message showing the email address that automates the password reset. No need for a separate web page, no need for dedicated machines pointing to a self service portal! To do this, set the Group Policy settings Interactive Logon: Message text and Interactive Logon: Message title. Both of these settings are found under: Computer Configuration/Policies/Windows Settings/ Security Settings/Security Options. 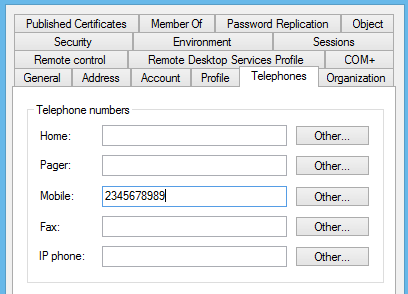 You can take a few routes to populate Active Directory with mobile numbers. If you would like a user driven (as in you don’t do the work) approach read this How To Guide and automate that process! If you can’t trust your users to do this (or have security policies against this), you can use this PowerShell approach by reader Michael Zinn. $Mobile = "$Mobile" -Replace "[^\d]"
To get users accustomed to self service, you have to have buy-in from your whole IT department. Encourage helpdesk staff to direct users to reset their own passwords. It might be a bit more difficult at first but the benefits are huge in the long run. One college IT administrator told me that 26,000 passwords have been reset with this method over two years! Talk about awesome! Have you implemented a self service password reset tool? Tell me about your experiences in the comments below. $user = get-aduser -filter "mobilePhone -eq $Phone"
Do you need to add a user to a group? Do you want to ensure that certain groups only contain members that you specify? Group Policy Restricted Groups allow you to easily do both! If you are already using restricted groups, I have three tricks that will let you take group management to a new level. Read on! In our first scenario, we want to explicitly control local group membership. We will populate the local administrator group with objects of our choosing. We will remove any user/group not in our selection by using the Members of this group feature of Restricted Groups. Start by creating a new GPO named Restricted Groups: GROUP NAME (ex: Restricted Groups: Local Administrators). Edit the GPO and navigate to Computer Configuration/Policies/Windows Settings/Security Settings/Restricted Groups. Under Group Name, right click and select Add Group. Do not enter in a name as the group’s SID will not be recorded. Select browse instead. * Under Locations, change the value from your domain to your local machine. Search for Administrators and press OK. You should now see a new group named Administrators listed. Double click on that group and press the top Add button. Browse but leave the search on your domain name. Search for Domain Admins and press OK. After you finish adding groups to the Administrators restricted group, you should see them listed under the members tab. When this GPO is applied to a computer, it will remove all members from the group specified. It will then add the members that you specified. In our example above, only domain administrators (and the built-in local administrator user) would be a member of the local administrators group. Group Policy Software Installation (GPSI) is one of the greatest gifts that Microsoft has given you! It is a free and semi-robust application deployment solution. Almost any organization can manage their entire application infrastructure with it. GPSI does have a few limitations though. One notable limit is the all or nothing redeployment option. Wouldn’t it be awesome if you could selectively reinstall applications for a specific computer or for a small group of computers? Today, we are going to learn how to reinstall an application on a single machine and on multiple computers. One project that consistently saves me time every day is my custom Active Directory Users and Computer MMC. This MMC contains quick links to commonly visited OUs and embedded scripts for fast access! But this custom MMC only saves me time if I update it to match my current work. Because of a very large site migration, I found myself needing to duplicate group memberships very quickly. I was pulling a fireman and migrating group memberships manually. What I needed was an extendable but simple way to automate this. Once again, PowerShell came to the rescue! The script below makes duplicating group memberships with PowerShell a breeze! This PowerShell script makes use of the Quest AD cmdlets. If you don’t have these cmdlets installed, you can download them from here. This script is designed to be completely standalone. Because of that, we start by adding our Quest tools and prompting for a source and a destination computer. $SourceComputer= read-host "What is the source computer? (This computer is in the groups already.)" $DestinationComputer= read-host "What is the destination computer? (This computer needs to be added to groups.)"